SPIROL manufactures specialty precision shim washers in any flat and round configuration with thicknesses ranging from 0.02mm to 9.5mm (.001" to .375") to meet the requirements of unique applications. Most secondary processes are performed in-house to guarantee quality, reduce lead times and lower cost. SPIROL produces custom precision shim washers that range in size from a minimum ID of Ø1.2mm (Ø.048") to a maximum OD of Ø1220mm (Ø48"). SPIROL's precision Washer product line includes Thrust Washers, Compression Rings, Piston Rings and Cylinder Rings. SPIROL's Thrust Washers feature less wear and longer life for reduced serviceability costs in a variety of high-wear applications including heavy equipment, automotive, transmission, and industrial power generation. They can be case hardened or through hardened to meet specific application requirements. 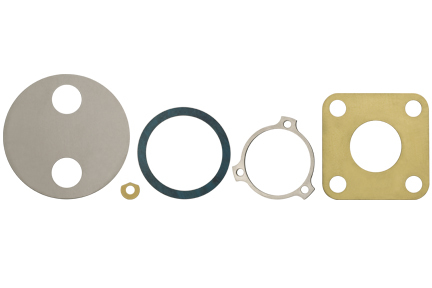 Precision Compression, Piston and Cylinder Liner Rings are commonly used for engine applications that require precision-engineered metal rings. SPIROL can maintain surface finishes to 0.2 µm (8 µin.) and hold flatness without grinding up to 0.04 per millimeter (.0015 per inch). With grinding and lapping, tighter flatness tolerances can be held. SPIROL also manufactures disc springs per EN 16983 (DIN 2093) as a standard product offering, as well as custom Disc Springs to meet specific application requirements. Please click here for more information about SPIROL's Disc Springs.